Before starting the works following equipment shall be arranged. QUY80A Hydraulic Crawler Crane 80t – Lattice boom crawler crane with retractable tracks, suitable for work on a leveled platform. ICE815C Vibratory Hammer with power pack- 1 Nos. The vibratory hammer is a purpose-built hydraulically driven hammer complete with caisson beam and caisson clamps. The following immediate steps will be taken in order to ensure an early start to the sheet piling works. Before starting driving of sheet piles, ensure all utility services are diverted from beneath shoring line. Required layout shop drawings based on actual site Survey & measurements. Mobilize Piling Plant & Machinery and set up the same on site. Start preparing temporary land access to provide a proper working platform at areas where the main wall sheet piles to be installed. Transport sheet piles and off-load on site at working locations. Cleaning inside the clutches will be applied prior to lifting the sheet pile for pitching. Fix temporary driving Guide Frame at survey lines in order to ensure verticality and alignment of the sheet piles. The frames will consist of vertical end members (legs) along with two H-Beams will be fixed horizontally, with a gap provided between their faces in order to allow for the pitching of the sheet piles. The temporary sheet piles lengths will be pitched in single/double pieces, utilizing crawler crane with a release shackle attachment. 80 ton crane (erect the vibratory hammer) will clamp on top of the pitched sheet pile and vibrate it in place, until the required toe level is reached. The same operation will be repeated till each frame is completed (as per required depth). The frame will then be shifted forwards and the installation of sheet piles re-started. A special temporary frame will be fabricated for the corner sections of the wall, while pitching/driving operation will remain the same as above. 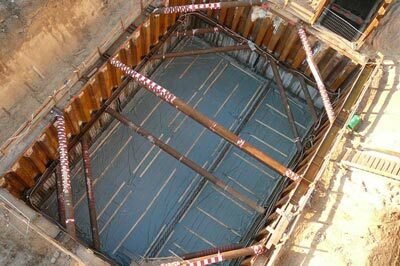 Special care will be taken in the corner sections in order to ensure the alignment and water tightness of the sheet piles wall. A full experienced driving crew, equipped with piling, lifting and welding equipment will be employed on site. This crew will be lead by an experienced supervisor on projects of similar nature who will be working under our project manager on site. The crew will have back-up equipment available to support them in case of breakdowns. Upon completion of the main construction works for which the shoring constructed, the temporary sheet piles will be extracted utilizing Crawler Cranes and Vibratory Hammers. All extracted temporary sheet piles, frames, materials, etc. will be loaded and transported off-site.